I'm coming to my canning late this year, due to the late produce being, well, produced this summer, and then there were things like surgery...anyway, I realized this week if I don't get on it, the season, such as it is this year, will have passed me by. Since my little raspberry vines are still small enough this year to produce only a handful of berries, I trekked to the farmers market this morning and bought the last gasp of strawberries for more jam, and a flat of raspberries for this year's batch of the husband's favorite, raspberry jam. Those aren't leaves or needles or seeds on the side of my measuring bowl, but...I don't know, exactly. Baby slugs? Tiny worms? Whatever. I am not super squeamish, being farm raised, but I do have my limits. I immediately felt mildly ill about the few berries I ate while sorting them earlier. Ugh. Ah, well. The trick with raspberries is, if you rinse them too vigorously, you lose a lot of the firm juicy berries, and end up with watery mush. But I do not prescribe to the school of no rinsing, for exactly the reason you see above. So, I rinsed them five or six times in cold water, then dumped them in a pan and proceeded to heat and mash them until anything living would be dead. 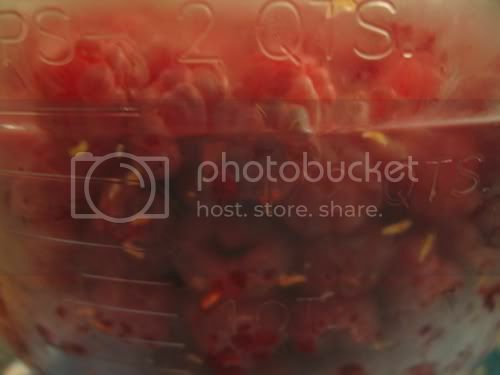 Now the berries are sitting in my fridge, slowly draining juice through a sieve and several layers of cheesecloth. I do not care for seeds in my jam. Or slugs, or worms, or whatever. But I very much doubt a single one of those little critters could survive the rinsing/heating/mashing/sieving process. Right? Ah, well. I'm sure I consumed much worse with all the gallons of wild blackberries I ate out of our field growing up, back when I didn't pay enough attention to look and see what might be on my berries. If nothing else.. it's extra protein? Though, I can't really be squicked, I eat blueberries after flicking off the bugs on them, without washing them -- have done the same to raspberries I've found in the wild, and blackberries growing on vines along the ground. For a second that looked like blood platelets. Freaky.